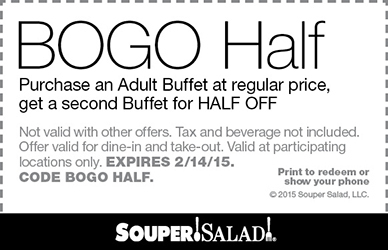 Must Sign Up: Purchase an adult buffet for only $7.49 at a participating Souper Salad restaurants near you. Valid on up to 4 meals. Print and bring coupon when ordering. Why join their Souper Fresh club? Get a $3 rewards coupon just for joining. Earn 5 Points for every dollar spent, receive a $5 reward for every 500 Points you earn. You will also receive special promotions, coupons and invitations to exclusive events at Souper Salad locations. Souper Salad’s buffet features made-from-scratch soups, fresh salads and fruit, delicious made-from-scratch breads, baked potatoes, and dessert. . Kids eat for $0.99 or Free with costume, adult buffet purchase required. Print coupon, purchase an adult buffet at regular price and receive a second one half off at a participating Souper Salad restaurant near you. Souper Salad satisfies your appetite with award-winning Salad Bars plus a healthy and delicious menu: Soups, Salads, Walkabouts, Wraps, and Sandwiches. Souper Salad is a soup and salad restaurant chain in the southwest US. Their soups are prepared daily in fact, there’s a new menu every day for each location! Enjoy one of their handcrafted soups or hand tossed salads at a low price with their in store coupons.